DocuSign has appointed a new CEO, Dan Springer. Springer was previously chairman and CEO of public SaaS company, Responsys. He will be looking to make the DocuSign offering to real estate agents more comprehensive. 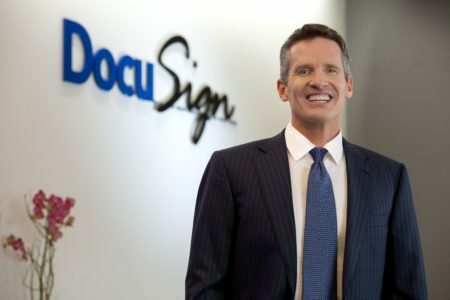 DocuSign has appointed a new CEO, senior tech executive Daniel Springer. Springer was previously chairman and CEO at Responsys for 10 years, where he transformed and scaled the business from private start up to the leading cross-channel marketing automation platform globally and a publicly traded company. He has more than 25 years of executive leadership and experience in driving innovation and hyper growth across technology and, specifically, the software-as-a-service (SaaS) industry. As chairman and CEO of Responsys for a decade, Springer transformed the company into an industry leader, drove its initial public offering on NASDAQ, and led its sale to Oracle for $1.6 billion in 2014. Former DocuSign CEO Keith Krach will remain as an “active” chairman at DocuSign, continuing to work with key partners. Springer has already formed plans for improving the DocuSign offering to the real estate industry, the first vertical market DocuSign focused on. “In a way, we grew up together, and we still consider it one of our most important industries,” he said. “We’ve done a good job of establishing eSignature and digital transaction management in the real estate space. We’ve worked to bring Realtors, buyers, sellers and others together to collaborate through DocuSign Transaction Rooms for real estate. And we’ve worked to create eNotary and other services that streamline the process. Payments is another key area that DocuSign is focused on, since the announcement of DocuSign Payments in October last year. “Buying a home normally involves the signing of a huge amount of paperwork — and then you have to write checks to escrow for the first payment of the loan and property taxes, and there are various other payments that are necessary. We think there’s a big opportunity to streamline that entire process using DocuSign, and it’s something we’ll be spending time on as part of our broader ‘lead to close’ strategy for real estate,” said Springer. In February, DocuSign will introduce eNotary, an enhancement that eliminates the need to print, scan or mail closing documents. All actions can be performed within the DocuSign platform, including applying a seal and exporting a notary log. These in-person eNotarizations can be performed via DocuSign in Alaska, Florida, Idaho, Indiana, Kansas, Kentucky, New Jersey, New York, Virginia, Washington and North Carolina. Springer’s experience in taking an SaaS company to IPO will come in useful if DocuSign decides to take that route as expected. Springer said on day two that he couldn’t speak to the the timing of an IPO, but he said the company is ready and has got the scale, growth, and management in place for when the time is right. DocuSign has 130, 000 new people coming on DocuSign every day and has 100 million users total on the network. Who's winning the transaction management arms race?